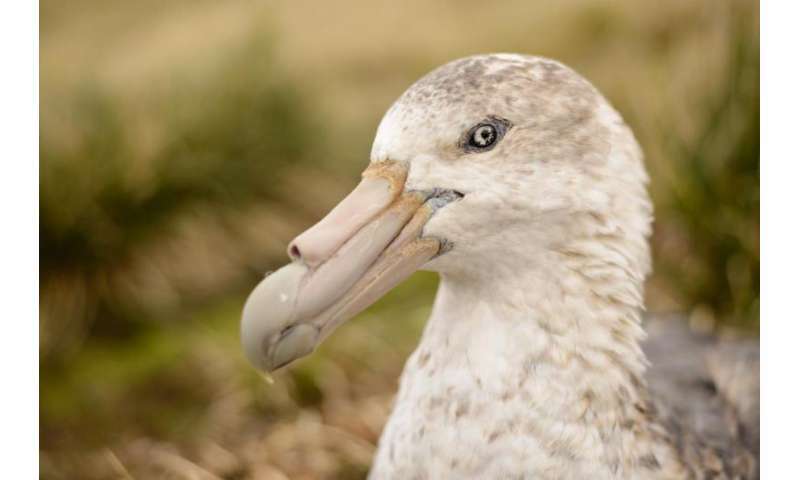 A fifty year study of the charismatic seabird, the southern giant petrel, on the Antarctic island of Signy shows its population has halved and its breeding success has declined in the last 10-20 years. The results by scientists at British Antarctic Survey (BAS) are published this month in the journal Polar Biology online. Southern giant petrels are large, colonially-nesting seabirds with wingspans of over 2 m capable of long-distance ocean travel. They feed on prey ranging from crustaceans (including Antarctic krill), squid and fish at sea, to penguin and seal remains on land. Most birds breed for the first time only when they are between six and ten years of age, and they produce at most one chick per year. Scientists have studied the giant petrels breeding at Signy Island - in the South Orkney Islands (60°S) - since 1968. Twenty years ago, a structured monitoring program was introduced to keep a closer track of numbers of breeding birds and how many chicks fledged each season. These surveys - the most detailed on this species in the South Orkneys - have now revealed that breeding success has declined substantially, from 60% in 1996 to 40% in 2015 in selected study colonies. Whole-island counts show that following an increase in breeding numbers from the mid 1980s to the mid 2000s, the population has halved from over 5800 to around 2600 nesting birds since 2005. "In the fifty year study we found that although the population fluctuated periodically over this time, in the last 10 years, both numbers and breeding success have declined. Since the South Orkney Islands, of which Signy is part, represent nearly 10% of the global population of this species, continuation of such a decline both at Signy and elsewhere in this island group would be of conservation concern." Considerable variations in breeding pair numbers and breeding success of southern giant petrels have been observed at other islands in the Southern Ocean, and it is clear that this species will defer breeding in years when environmental conditions are poor. "The results are surprising because this species seemed to be doing well on Signy. We really don't know what's causing this decline. It could be a reduction in sea ice or other factors affecting food availability and we don't know if it's affecting the species regionally or more widely. "This study illustrates how the conservation situation of a species can change in only a few years. Formerly considered to be in the IUCN Red List category of Vulnerable, the southern giant petrel was re-categorised as 'Least Concern' in the late 2000s because positive trends at some sites counteracted negative trends elsewhere. However, if breeding numbers and success at Signy do not improve, and populations elsewhere in the Antarctic have continued to decline, then the IUCN status of this species will need to be re-assessed." The research highlights the importance of long-term monitoring programmes even for species thought to be doing well and not just those already known to be in decline. The challenge now is to understand which climatic or other environmental factors are driving these big changes for this important Antarctic predator.